To Cite: Daer A A, Abuaffan A H. A Cephalometric Study of Soft Tissue Norms in Yemeni Adults, Iran J Ortho. 2018 ; 13(2):e9706. doi: 10.5812/ijo.9706. Background: Evaluating patient’s soft tissue profile is one of the most imperative components for orthodontic diagnosis and treatment planning. Objectives: The purpose of this study was to determine the soft-tissue cephalometric standards for Yemeni adults. Methods: The material composed of the lateral cephalometric radiographs of one hundred ninety-four Yemeni adults (105 females and 89 males) aged between 18 and 25 years, selected from dental students in Sana’a University. Each film was traced and analyzed using variable linear and angular measurement. Results: Statistical significant differences were reported among genders in H- angle and N’-Pr-Pg’, whereas, N’-Sn-Pg’, nasolabial and mentolabial angles showed no significant differences. Conclusions: The results of Yemeni cephalometric analyses showed ethnic differences in soft tissue findings. Considering the soft tissues pattern of each population will guarantee improved results of treatment to establish the best possible facial harmony. The importance of cephalometric norms relevant to particular ethnic groups has been proved to improve facial esthetics. Currently, a large group of Yemeni adults are looking for orthodontic treatment. Therefore, a more accurate and comprehensive soft tissue cephalometric parameters of this ethnic group is needed. Most countries, including Arab countries, had studied their norms. (1-8) Because of the varying thickness of the soft tissue, it might not follow the hard tissue in some cases. These differences might cause unsatisfied treatment results, if it is based on skeletal analysis alone (9). Miyajima et al. found that the Japanese had more dental protrusion, with a more acute nasolabial angle, and a greater tendency towards bilabial protrusion, in comparison to European-Americans (10). Johannsdottir et al. described the craniofacial characteristics of Icelandic adults, as the lips were less protrusive in males, but the thickness was greater compared to females. Also, the nose was significantly more protrusive in males (11). Naranjilla and Rudzki-Janson compared the Filipinos with the Germans, and found that the Filipinos’ had greater Holdaway angle thus exhibiting more lip protrusion. The Filipinos revealed a convexity in the facial profile whilst the Germans displayed a straight profile (12). Basciftci et al. studied the Holdaway soft tissue standards for Anatolian Turkish adults, and concluded that all soft tissue measurements were similar to Holdaway norms Except for the measurements of soft tissue chin thickness and basic upper lip thickness (8). Hwang et al. concluded that the Korean sample, have a less nasal inclination and less chin protrusion, but a more lip protrusion compared to the European-American adults (13). Flynn et al. compared the black Americans with white American adults, and found that the former to have a greater skeletal facial convexity, lower incisor proclination, upper and lower lip lengths, less bony chin depth, soft tissue thickness of the lips and chin, less nasal depth and projection, and a smaller nasolabial angle (14). Al-Jasser studied the Saudis norms, and concluded that the Saudis had less convex facial convexity angle and more anteriorly positioned upper and lower lips, in comparison with Caucasians (15). Moreover, Hashim and AlBarakati reported significant differences in most of the soft tissue variables when comparing Saudis with Caucasian Americans results as well as other ethnic groups (16). Aboul-Azm and Fahmy initiated soft tissue profile standards for Egyptian adults, and recorded that the Egyptians had a smaller gonial and Z-angles, and also had more facial convexity when compared to American white adults (17). To our knowledge, regrettably, several orthodontists in Yemen used to treat patients without skeletal, dental or soft tissue guidance, to which the treatment should have been intended. In Yemen, only one study by AL-Gunaid et al., for the cephalometric soft tissue features of Yemeni male norms was published (1). This study will attempt to establish the soft tissue cephalometric standard features of Yemeni adults (male and female), which are essential in orthodontic diagnosis and treatment planning. The current study consisted of 194 Yemeni adults (105 females and 98 males), aged between 18 and 25 years old. The study had been carried out at three faculties of dentistry in Sana’a. A letter of ethical clearance to conduct the study was obtained from the Dean Faculty of Dentistry, Sana’a University, to Al-Salam Science and Technology University (Faculties of dentistry). A clinical examination was carried out for all dental students in the three universities (1585 students). At first, the goals of the study were explained prior to the clinical examination. Students who met the inclusion criteria were registered. The inclusion criteria were: Normal occlusion with balanced facial profile, full permanent dentition (except for the third molars), class I molar, incisor and canine relationship, normal overjet and overbite, normal transversal occlusion, well aligned or crowded teeth not more than 2 mm and no previous history of orthodontic treatment. The selected students were called for an X-ray (which was taken according to a schedule made by the X-ray center). On the day of the X-ray, each student signed a consent form and also wore a Lead apron for protection. The radiographic unit was Pax-flex3D. Each cephalometric film was placed with the profile to the right on X-ray illuminator box. The tracings were performed on standard acetate paper in a dark room using illuminator box. All radiographs were traced by the main investigator manually; Hard and soft tissue were located on the tracing paper using 0.5 sharp pencil (Figures 1 and 2). 1. Holdaway’s (H angle): It relates the soft tissue profile to the hard tissue profile. 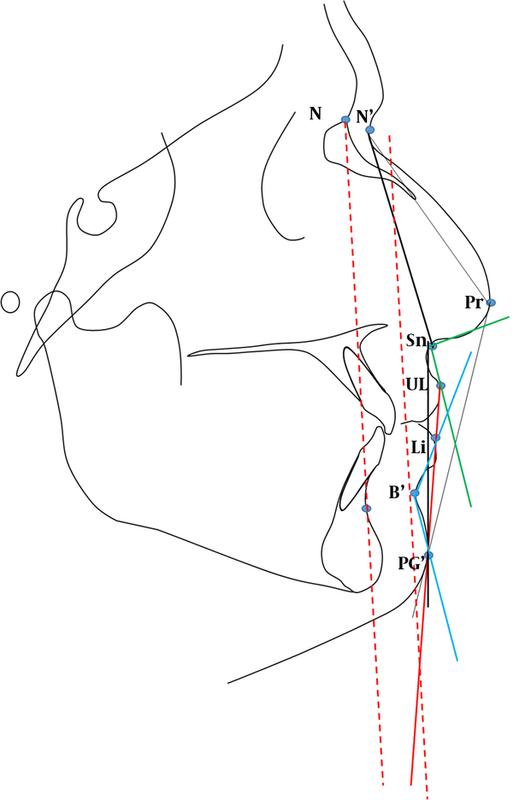 The angle is formed between the H line (PG-UL) and the hard tissue line NBL. The data were collected, summarized, and coded; then loaded to the Statistical Package for Social Sciences (SPSS) program (version 20). The arithmetic mean, standard deviation, minimum and maximum values, and descriptive statistic were done for each variable. An independent sample t-test was used to compare male and female. P value of less than 0.05 was considered as significant. Replication of measurement is a good method to quantify and control random error results of a trial. It might not be reliable if no satisfactory control of the measurements error was performed. Dahlberg formula was used to assess the reliability of the study. Thirty cephalogram (fifteen from each gender) was selected randomly. Table 1 shows the error of measurement regarding 5 soft tissue variables of cephalometric X-ray according to Dahlbergs formula. Paired t-test showed no significant difference between the first and second readings. The total number of the dental students participated in this study was 194 students (105 females and 89 males) aged 18 - 25 years. Table 2 shows descriptive statistics for the soft tissue patterns of Yemeni adults. Table 3 shows the mean, maximum, minimum, standard deviation and P value of soft tissue cephalometric features of both gender. The descriptive statistics of the soft tissue values were measured by Holdaway angle, angle of soft tissue facial convexity excluding the nose (N’-Sn-pg’), angle of total facial convexity (N’-Pr-Pg’), nasolabial angle and the mentolabial angle as showed in Figure 2. The mean value of the Holdaway angle in Yemeni adult norms was found to be 12.3º + 3.65 and 10.6 º + 4.1 for males and females respectively. Males had a statistically significant higher value than females. The mean value of the angle of soft tissue facial convexity (N'-Sn-pg') was found to be 158.31º + 4.7 and 159.2º + 4.2 for normal males and females respectively. No statistical significant difference between Yemeni males and females. The mean value of the angle of soft tissue facial convexity (N’-Pr-pg’) was found to be 127.1º + 5 and 128.9º + 3.71 for normal males and females respectively. Females had a statistically significant higher value than males. Nasolabial angle of Yemeni norms showed a mean value of 105.5º + 13.4 and 106.8º + 13 in males and females respectively. No statistical significant difference between genders were noted. The mean value of mentolabial angle in norms represented 141.7º + 11.8 and 144º + 9.8 in males and females respectively. There was statistical significant difference between males and females. Females showed high mean value Figure 3. 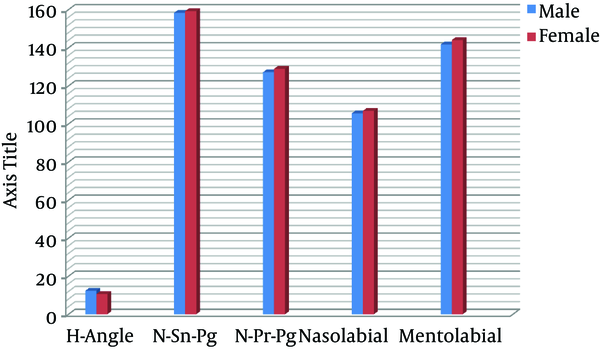 In the current study, H-angle and N’-Pr-Pg’ angle showed significant differences between genders, while N’-Sn-Pg’, nasolabial angle and mentolabial angle showed no significant differences. Concerning the Holdaway angle, the Yemeni population measurement showed a less value than that of a Saudi (3), Emirate (4), Palestine (5) and Turkish (8). In contrast, higher values were recorded amongst Germans (12) and European-Americans (13) populations. Al-Gunaid et al. (1) reported high value Holdaway angle amongst Yemeni males in his study, while Ne’am and Abdul-Qadir reported a higher value amongst Iraqi females (6). This difference in the results amongst different population can be attributed to the sample size and area of selection of the sample, environmental factors and ethnic background. The angle of soft tissue facial convexity, excluding the nose (N’-Sn-pg’), showed a reduced value in Emiraties (4) than that of a Yemeni, while Manopatanakul reported a higher value amongst the Bangkok population (18). In this study, the angle of total facial convexity (N’-Pr-Pg’) was in line to that reported for Icelandic (11) and Emirates males (4). Higher value was reported amongst Bangkok (18) and Emirates’ (4) female population. A much less value was found amongst Koreans and European-Americans (13). In the present study, the Nasolabial angle was less than that found by Al-Gunaid et al. (1) amongst Yemeni males. Also, Icelands (11), Emiraties (19) and European-Americans (13) showed a higher value than this study in both genders. On the other hand, a much less value was reported amongst Korean (13), Bangladesh (20), Japanese (20, 21), Caucasian (20) and Bangkoki (18) populations. In addition, Hashim (7) reported a lesser value amongst Saudi females. The mentolabial angle in this study showed a much less value than that reported amongst Koreans and European-Americans (13). The variation of cephalometric features of Yemeni population and other studied populations with normal occlusion, can be partially attributed to the ethnic background, variation of age group, sample size and environmental factors. Yemenis had distinct soft tissue cephalometric features, for which specific norms should be used as a reference in diagnosis and treatment of orthodontic patients. In comparison with other Arabic countries, Yemenis showed a different cephalometric soft tissue features which is also different than that seen amongst Asians populations. Patient Consent: On the day of the X-ray, each student signed a consent form and also wore a Lead apron for protection. 1. Al-Gunaid T, Yamada K, Yamaki M, Saito I. Soft-tissue cephalometric norms in Yemeni men. Am J Orthod Dentofacial Orthop. 2007;132(5):576 e7-14. doi: 10.1016/j.ajodo.2007.03.018. [PubMed: 18005826]. 2. Bishara SE, Abdalla EM, Hoppens BJ. Cephalometric comparisons of dentofacial parameters between Egyptian and North American adolescents. Am J Orthod Dentofacial Orthop. 1990;97(5):413-21. doi: 10.1016/0889-5406(90)70113-Q. [PubMed: 2333855]. 3. Uysal T, Yagci A, Aldrees AM, Ekizer E. Ethnic differences in dentofacial relationships of Turkish and Saudi young adults with normal occlusions and well-balanced faces. Saudi Dent J. 2011;23(4):183-90. doi: 10.1016/j.sdentj.2011.08.002. [PubMed: 23960514]. [PubMed Central: PMC3723299]. 4. Abu-Tayyem HM, Alshamsi AH, Hafez S, ElDin EM. Cephalometric norms for a sample of Emirates adults. Open J Stomatol. 2011;1(3):75-83. doi: 10.4236/ojst.2011.13013. 5. Hussein E, Khateeb SA, Watted N, Aksoy A, Acar A, Abu Mowais M. Evaluation of facial soft tissue parameters for palestinians using Holdaway analysis. Saudi Dent J. 2011;23(4):191-5. doi: 10.1016/j.sdentj.2011.08.003. [PubMed: 23960515]. [PubMed Central: PMC3723361]. 6. Ne'am F A, Abdul–Qadir MY. Evaluation of Holdaway soft tissue analysis for Iraqi adults with class I normal occlusion. Al–Rafidain Dent J. 2008;(8):231-7. 7. Hashim HA. A cephalometric study of soft tissue relationship among Saudi female dental students. Saudi Dent J. 2003;15(1). 8. Basciftci FA, Uysal T, Buyukerkmen A. Craniofacial structure of Anatolian Turkish adults with normal occlusions and well-balanced faces. Am J Orthod Dentofacial Orthop. 2004;125(3):366-72. doi: 10.1016/j.ajodo.2003.04.004. [PubMed: 15014417]. 9. Bergman RT. Cephalometric soft tissue facial analysis. Am J Orthod Dentofacial Orthop. 1999;116(4):373-89. doi: 10.1016/S0889-5406(99)70222-2. [PubMed: 10511665]. 10. Miyajima K, Mcnamara Jr JA, Kimura T, Murata S, Iizuka T. Craniofacial structure of Japanese and European-American adults with normal occlusions and well-balanced faces. Am J Orthod Dentofacial Orthop. 1996;110(4):431-8. doi: 10.1016/S0889-5406(96)70047-1. [PubMed: 8876496]. 11. Johannsdottir B, Thordarson A, Magnusson TE. 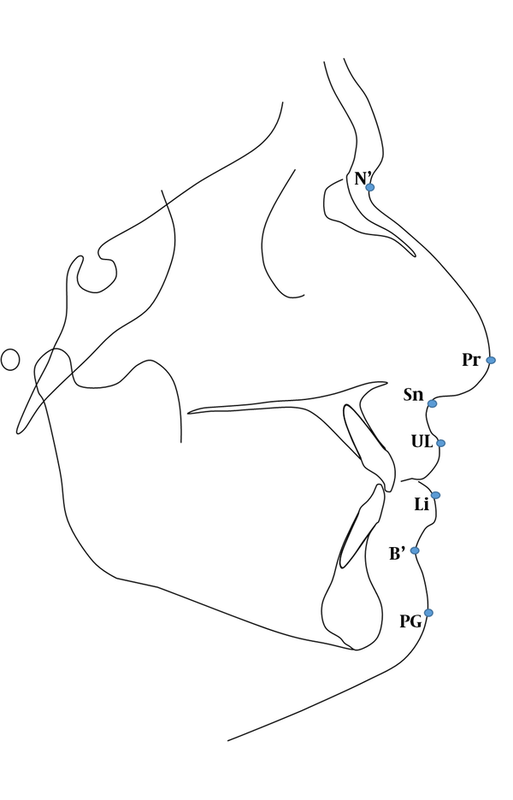 Craniofacial skeletal and soft tissue morphology in Icelandic adults. Eur J Orthod. 2004;26(3):245-50. [PubMed: 15222707]. 12. Naranjilla MA, Rudzki-Janson I. Cephalometric features of Filipinos with angle class I occlusion according to the Munich analysis. Angle Orthod. 2005;75(1):63-8. doi: 10.1043/0003-3219(2005)075<0063:CFOFWA>2.0.CO;2. [PubMed: 15747817]. 13. Hwang HS, Kim WS, McNamara JA Jr. Ethnic differences in the soft tissue profile of Korean and European-American adults with normal occlusions and well-balanced faces. Angle Orthod. 2002;72(1):72-80. doi: 10.1043/0003-3219(2002)072<0072:EDITST>2.0.CO;2. [PubMed: 11843277]. 14. Flynn TR, Ambrogio RI, Zeichner SJ. Cephalometric norms for orthognathic surgery in black American adults. J Oral Maxillofac Surg. 1989;47(1):30-9. [PubMed: 2911056]. 15. Al-Jasser NM. Facial esthetics in a selected Saudi population. Saudi Med J. 2003;24(9):1000-5. [PubMed: 12973487]. 16. Hashim HA, AlBarakati SF. Cephalometric soft tissue profile analysis between two different ethnic groups: A comparative study. J Contemp Dent Pract. 2003;4(2):60-73. [PubMed: 12761590]. 17. Aboul-Azm SF, Fahmy MA. Soft tissue analysis of the face in Egyptian young adults. Alex Dent J. 1980;5:85-92. 18. Manopatanakul S. The drawing of bangkokian cephalometric templates. APOS Trends Orthod. 2011;1(1):2. 19. Al Zain T, Ferguson DJ. Cephalometric characterization of an adult emirati sample with class I malocclusion. J Orthod Sci. 2012;1(1):11-5. doi: 10.4103/2278-0203.94772. [PubMed: 24987619]. [PubMed Central: PMC4072350]. 20. Ahsan A, Yamaki M, Hossain Z, Saito I. Craniofacial cephalometric analysis of Bangladeshi and Japanese adults with normal occlusion and balanced faces: A comparative study. J Orthod Sci. 2013;2(1):7-15. doi: 10.4103/2278-0203.110327. [PubMed: 24987637]. [PubMed Central: PMC4072372]. 21. Alcalde RE, Jinno T, Orsini MG, Sasaki A, Sugiyama RM, Matsumura T. Soft tissue cephalometric norms in Japanese adults. Am J Orthod Dentofacial Orthop. 2000;118(1):84-9. doi: 10.1067/mod.2000.104411. [PubMed: 10893477].